The long and successful life of John Crichton began in Minden, Louisiana, in 1920, the descendent of an affluent family in a small town where all the barefooted kids enjoyed the same happy semi-rural existence. World War II altered his course as he joined the army and became an infantry officer, a company commander, 155th Infantry, and an Intelligence Officer in the 6th Army, before being assigned as aide-de-camp to General Walter Krueger in the South Pacific. Discharged with the rank of major at war’s end, he earned a law degree at LSU, then began a progression in the business world which brought him wealth and successes in corporate management from coast to coast. Finally he has settled in San Antonio, where he and his wife, Flo Cameron Crichton, enjoy a well-earned retirement and the pleasure of watching the growth of their progeny. His “life of grace” has been full of instances of the special providence which seems to hover over him. 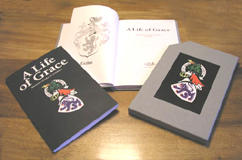 His book has been produced in limited editions in paperback and in cloth and slipcase. Neither is for sale.